I work for an orthopedic surgeon when I'm home from school so when I tore my ACL I knew it right away and I thought I knew exactly what was going to happen but boy was I wrong. I play field hockey at my college and last year during my junior year I tore my ACL during a game. I was devastated because I was having my best season ever. 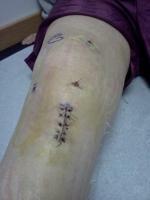 I went home and had surgery on Oct 22, 2008. I had a patellar tendon graft and they repaired my medial meniscus. I was doing great after surgery, off the crutches in a week, and almost full range of motion by day 12. Day 12 was a normal day until I was crossing the train tracks that run through the middle of campus, I tripped. I didn't fall but caught myself instead on my bad leg, I had immediate pain and couldn't move. My friends helped me into the backseat of one of their cars, I couldn't move my leg, bending it was excruciating, the pain was worse than when I tore my ACL and worse than after the surgery. I went to the ER and found out I fractured my patella. The doctor there made it seem like it wasn't a big deal and that a minor surgery would fix it, but he was wrong. I went home the next day to see my doctor and she scheduled me for surgery the next day. 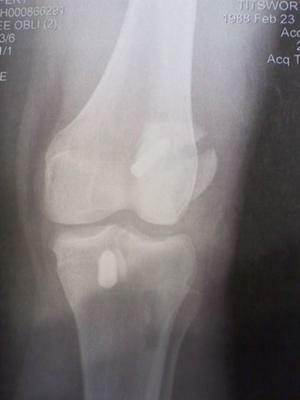 Only 2 weeks from my ACLr I had to have an ORIF of my patella (2 screws). This surgery was 10x more painful than the first and I thought I would never feel better. I couldn't even take off my immobilizer to shower, I was only allowed to have it taken off 10 days later to have my 27 staples taken out. My life seemed to fall apart around me, I was depressed and lost a lot of weight and I couldn't sleep anymore. hit therapy hard and it was tough. My knee locked out at 80 degrees and every day they would have to force it to bend until I had full range about 5 weeks later. I was fitted for a DonJoy brace in early March with the hope to start running, but then I developed pain in my shin and with a history of stress fractures my doctor said no weight bearing therapy for 4 weeks. I thought this would never end. I still returned to field hockey this season, I took it a little slow at first and continued doing PT with my trainer for the first half of season. I started and played every game and still had a great season regardless of all my issues. My quad is still much smaller and my knee still gives me issues but I can walk and was able to play my last season so I'm happy. Right now I'm taking some time off before I start running again, but my plan is to continue to run and hopefully one day run a 1/2 marathon. Words of advice, stay off uneven ground after ACL recon with patellar tendon graft and don't ever think you can't do it anymore. If you work hard enough you will get through it, a lot of people thought I wouldn't be able to play field hockey at the college level again and I did. And remember things could be worse, and if they are worse then know that you are not alone, a small amount of us have also been there!